Once regarded as a less-expensive alternative for commuters (by Manhattan residents anyway), Brooklyn has become much more than another of New York’s boroughs. With its fair share of trendy, wealthy and upscale neighborhoods as well as many that still retain their historic roots and culture, Brooklyn has variety that Manhattan does not. Brooklyn’s official motto, “Eendraght Maeckt Maght,” Dutch for “In unity, there is strength,” which holds true today with Brooklyn’s diverse residency. Neighborhoods such as Williamsburg have large Jewish populations, Brighton Beach and Sheepshead have many Russians and Ukrainians, Bedford-Stuyvesant has a rich African-American population, Sunset Park houses the third largest Chinese-American population in New York, and Bushwick is where Brooklyn’s Hispanic American population is most concentrated. Basically, the food in Brooklyn is awesome. 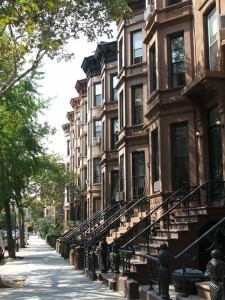 Park Slope, one of New York’s most desirable neighborhoods as rated by New York Magazine, resides in Brooklyn. This neighborhood, located on Brooklyn’s northwestern side right by Prospect Park, is renown for its excellent public schools, high-quality dining, historic buildings and architecture, and strong citizenry involvement. For example, the Park Food Slope Coop is a membership-based only grocery store where members have to volunteer for several hours each month to qualify. What results, however, is a community that works together and creates its own similarities and character. As one would expect, Park Slope’s rental prices are in the higher tiers, thus leaving a wealthy residency and some of the finest luxury apartments, lofts and townhomes in Brooklyn. Also, with Prospect Park so close, Park Slope is notorious for its pet-friendly atmosphere. If there is a cultural capital of Brooklyn, it would have to be amongst the neighborhoods of Fort Greene and Capitol Hill. You’ll find in Capitol Hill art organizations such as The Museum of Contemporary African Diasporan Arts and 651 Arts as well as many theaters while many famous writers have lived in the area such as Walt Whitman, Truman Capote, and Marianne Moore. Fort Greene and Capitol Hill are home to many of Brooklyn’s most famous schools such as the Brooklyn Academy of Music, Brooklyn Music School and Pratt Institute. As you can guess, the residency in these two neighborhoods consist of many creatives and students. Students looking for cheap apartments for rent in this area are going to head east towards Bedford-Stuyvesant where the homes for rent are less expensive. Besides being across the river from Manhattan, Brooklyn has all sorts of opportunities for fun. For example, the Gateway National Recreation Area borders Brooklyn to the east and is the perfect place for an outdoor adventure with activities such as boating, biking, camping, and cross country skiing during the winter. Meanwhile, the southern part of the city is home to the historical Coney Island along with the Brooklyn Cyclones minor league baseball stadium. Finding apartments on Brooklyn’s southern parts will result in many high-rise options. Over the last few years, the area has seen a surge in apartment construction, so for those apartment searching for brand new apartments, this is the area to go. For those that want to be close to the ocean and still pay a cheap rent, Sheepshead Bay is one of Brooklyn’s more affordable communities. Fishing is a strong cultural aspect of this community that has long been the place of many Turkish and Ukranian immigrants. You’ll find brick row houses, six-story apartment buildings and larger single-family homes in these neighborhoods, all contributing the slower, family-oriented pace of life. Finding an apartment with all bills paid will not be as difficult as it would be in Park Slope, but using an apartment guide over craigslist will definitely help find quality options. Despite how close it is to Park Slope, Red Hook has a much different atmosphere and is less expensive to live in. Although once the home of Al Capone, Red Hook has a very clean atmosphere with fun bars (Fort Defiance has amazing cocktails) and restaurants (Lobster Pound for excellent seafood) and amazing views of the Statue of Liberty from its many piers. The area feels somewhat isolated form the rest of Brooklyn due to its lack of public transportation, though most residents agree that this is only a positive thing. However, for newcomers, many of the industrial warehouses alongside the waterfront have been converted into living spaces, great for those looking for studio apartments with all bills paid. The rest of the neighborhoods are comprised of attached and detached houses that add to the small-town vibe of Rest Hook. Amazing Japanese bakery on Murray St. -- would go there every Saturday morning. Also really close to 4 different subway lines. Great location with access to the Hudson River walkway and pan-city transportation. Great restaurants, lots of stores, many parks and so many friends waiting for you in this neighborhood. An incredible value when compared with what we found in NYC for the same price! Loved our apartment, especially the view right over the Hudson! I lived in Jersey City for three years and loved it. The proximity to NYC was great, but it's also just a bit calmer than NYC itself. In retrospect, I think it's a great place to start a young family with Hamilton Park and Van Vorst Park beckoning as green space. More parks have opened since we left. Shopping was more than adequate -- Shoprite, Target, Home Depot, standard stores in the mall and plenty of small, local shops. It's a very mixed population in terms of race, nationality and income level as well, something that I value. And if you're looking for a church, I highly recommend the weekend services at OLC. The building leaves a fantastic first impression. The lobby is great as well as all of the shared space. Over time however, you realize that you are living in an old office building. It feels that way. There's no light whatsoever, there is nothing to do nearby in the evenings or on weekends. All of the added features (movie theatre, piano lounge, foozball, and ping pong) don't matter after the first week. It's quiet, but in a depressing way. Brooklyn Heights, specifically the 20 or so square blocks southeast of the promenade, has all the sophistication of Manhattan, some of the most beautiful brownstones in the world, all within a serenity found few other places in the five boroughs. Ranked #1 HS in NYC by US News: The Baccalaureate School for Global Education (BSGE) promotes intellectual and social development through the International Baccalaureate framework. Instructors at BGSE participate in professional development sessions regularly, and the school’s small class sizes help foster mentoring opportunities with students. Baccalaureate School for Global Education’s student body is a diverse mix of young adults from various neighborhoods in Queens. Students participate in service projects and can join a number of after-school clubs and activities, including athletics. I lived in Stuy Town with my girlfriend, and we loved it. It was accessible to all the fun of the east village - bars, restaurants, etc. - and union square. It was also a quiet getaway from the rest of the city and a good value. Apartments in this area are generally nice and it is safe. Convenient to grocery and drug stores, but not convenient to the subways (only close line is the L). Not in the center of fun, but a short walk to the fun part of 2nd and 3rd ave. Also a short cab ride to Soho/EV. Lived here for two years - really miss it. Right in the heart of the west village and all its great restaurants and bars. Washington Square Park is only a few blocks away - maybe my favorite place in the city. Subway with express trains to midtown is one block away. Can't beat this neighborhood. Lived here for a year. Good social scene for right after college, but restaurants aren't great and it's tough to get across town without a long walk or a cab. Great restaurants and social life, really pretty and relatively quite / calm area. Easy walk to Union Square to get around by subway. Highly recommended. Good access to rest of city, okay neighborhood. Great access via subway to the rest of the city, perfect if you work in midtown and want to go downtown for social events. Neighborhood itself is pretty nice, especially to the south and east (Madison Square Park / Flatiron), but north is pretty run down. The LES is such a cool area with so many amazing bars, restaurants, and shops. It's also convenient to public transportation if you don't mind the FJ line. Try Clinton St. Baking Company. Don't be fooled by how this neighborhood looks by day. At night, this place is amazingly fun and hip and worth the rent you're going to have to shell out. Is the park worth it? Loved (LOVED) the proximity to the park, ease of getting to any subway line, and the walk to work (even though it was through Times Square). However, the lack of "neighborhood charm" - e.g. non-Starbucks coffee shops, fun places to go out, and the fact that I had to take cabs every time I wanted to meet up with my downtown-living friends ultimately drove me to SoHo. The West Village is amazing if you love quiet, narrow streets, low-rises and lots of cute cafes and restaurants. But you pay a price for it! Rents are high, apartments are small and often walk-ups. Thompson st. is relatively quiet compared to the rest of Soho, but you'll still have hordes of tourists walking around on the weekends. There's a neat old Italian community in this area. When you walk around, look up and you'll see old ladies sitting on their fire escapes next to Italian flags. Apartments are small and typically old. Soho is fun but I much prefer the East Village. East Village? Go farther East! I lived here for two years and it was by far my favorite spot in Manhattan. You're a little further from the subway but the apts are bigger. You're right next to the river which is a great place to run. Ave C is totally safe (seriously, I did the research and more crimes occur in the middle of the village). I loved living in Brooklyn Heights. Just two stops outside of Manhattan on the 2,3,4,5,N or R it was super east to get to the West or East side and even the Lower East Side. The famous Brooklyn board walk made for excellent runs with an amazing new park right under the Brooklyn Bridge. It didn't hurt that the Brooklyn Bridge was nearby, again making for excellent runs. Montague street itself is full of great restaurants. It's no wonder the post-MBAs at my firm like to live our here. This is a great place to live if you're new to NYC because it feels sort of like a smaller community and is surrounded by acres of parkland. Yeah, the subway access isn't the greatest but the apartments are huge! I loved living in this area because you have incredible access to so many subway lines, especially if you live on the southern end of Tribeca. My commute to midtown was 20 minutes, I could be at Columbia in 30 minutes, or Brooklyn in 15.
friends live here. good spot - easy metro access to most of the city. RentLingo is your trusted apartment finder in New York City-Brooklyn. We hire local experts, such as former property managers and locators to anonymously tour and consistently rate and review every available place. They share their honest and unbiased perspective with you, so you know how every rental ranks in the area. Because our experts tour every property, we can offer consistent apartment ratings across every region. So unlike finding a Backpage or Craigslist rental, you can trust these apartments are verified and trustworthy: whether it's a cheap studio or a one bedroom with all utilities paid all the way up to a nice house for rent or a luxury condo.